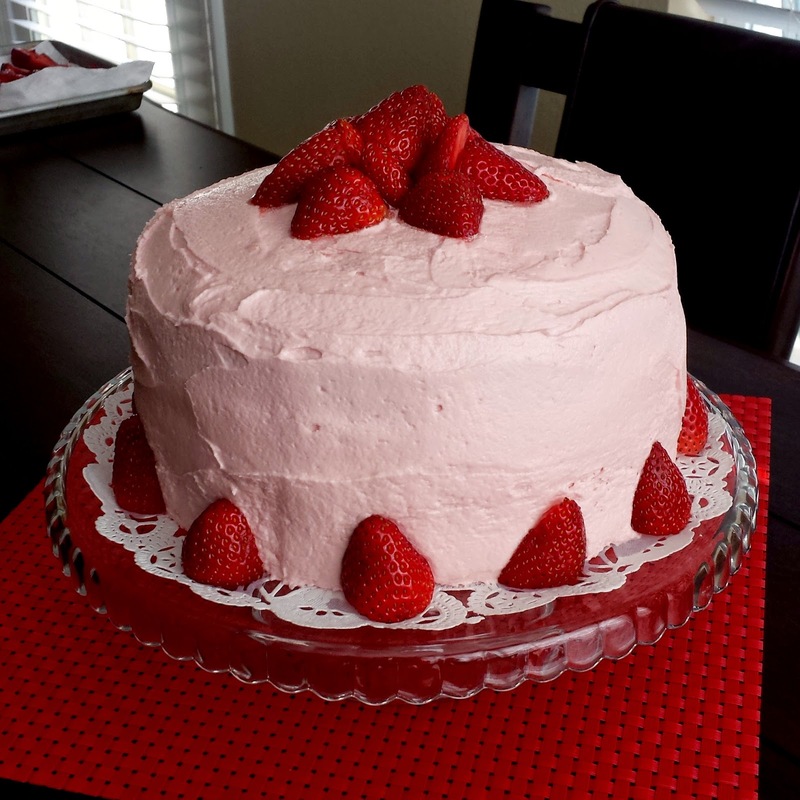 By far, the best strawberry cake I've ever tasted! Definitely adding this one to my all-time favorite recipes. Enjoy! 1. Preheat oven to 325º. Cut parchment paper to line the bottom of two 8" pans and place inside. Spray both pans with Baker's joy and set aside. If you don't have Bakers Joy, spray the pans, then lightly "dust" them with flour. This will prevent the cakes from sticking to the pan. Do not omit this step! 2. In a large bowl, beat all ingredients together on medium speed until there are no more lumps. (Batter will be thick). Divide batter evenly between both pans. Pound pans 5-10 times on the counter to remove any air bubbles. Place on a baking sheet and bake for about 30-35 minutes (longer, if necessary) until the cake springs back when touched. Insert a toothpick in the center - if it comes out clean, the cakes are done! 3. Remove from oven and place on a wire rack. Cool in the pans for at least 15 minutes, then turn out on a cooling rack and cool completely before frosting (otherwise frosting will melt!). 1. In a large bowl, cream together the butter and shortening until smooth. 2. Add the vanilla and stir to combine. 3. Slowly mix in the powdered sugar, one cup at a time. 4. When it starts to get thick or difficult to mix (at about cup #6), go ahead and mix in the strawberry syrup and milk. 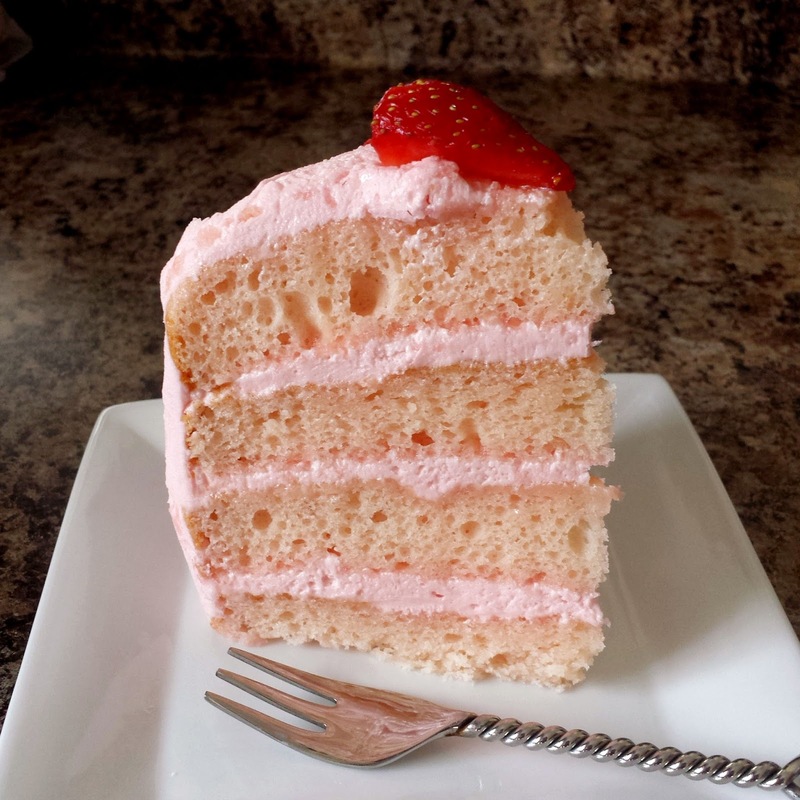 If it's still too thick for spreading or decorating, add more milk as needed to reach the desired consistency.